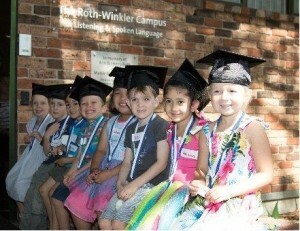 When school resumes later this month The Shepherd Centre’s newest graduates will be celebrating their latest milestone. A total of 48 children – the largest ever-graduating class in Shepherd Centre history – have just finished the best part of five years of early intervention developing their language and listening skills. Now each graduate, such as Eli from our Newtown centre, and Nate from our Canberra centre, are ready for big school with language, vocabulary and speech skills that match, and in many cases surpass, those of their full hearing peers. From our Newtown centre we celebrated eleven children graduating, another record number of five from Teleintervention, nine from Macquarie, eighteen from Liverpool, three from Wollongong and seven from Canberra. Both milestones mark the beginning of a spoken language future, and the opportunity for graduates to reach their full potential. “We want to send a big thank you to our families, supporters and staff for their strong support of our 2015 graduates,” Dr Jim Hungerford said. The Shepherd Centre will continue working with families through our school-aged programs and looks forward to hearing about the adventures of our graduates at big school.